A black and white large format negative of Wanda Mae Wilson taken on April 3, 1946. In this view Wanda Mae is standing inside of a playpen. This negative has started to degrade. Herbert John Kean (Jack) Wilson was born on 22 July 1911. He died in Whitby, Ontario on 8 April 1981 and is buried in Union Cemetery, Oshawa, Ontario. Chloe Isabelle (Effie) Gorsline Wilson was born in Bedford Mills, Ontario on 21 December 1910. She died in Oshawa, Ontario on 1 August 1992 and is buried in Union Cemetery. Jack and Effie had two children Wanda Mae and Margo Elaine. 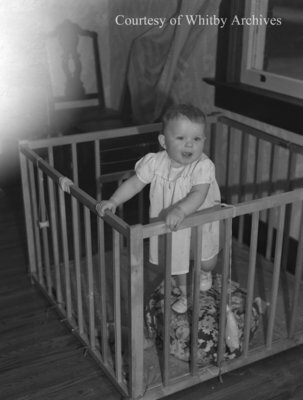 Wilson Baby, April 3, 1946, Marjorie Ruddy. Whitby Archives A2013_040_460.